A Kansas State University expert is underscoring the critical need to get water and reliable feedstuffs to cattle in the aftermath of wildfires that have ravaged many parts of southern and western Kansas. As of Saturday, the wind-whipped fires had scarred nearly 711,950 acres in 21 counties and forced numerous evacuations and road closures. The number of livestock and wildlife that have died in the fires is not yet known. Justin Waggoner, a beef systems specialist in southwest Kansas, said the fires have crippled systems that are ordinarily used for getting water to cattle. In some cases, producers may be forced to haul water to thirsty cattle. In areas where cropland has been spared from fire, wheat pasture or crop residues may be an option. There are also hay relief efforts taking place in many areas to help producers feed their herds. The abrupt dietary switch to wheat pasture, however, may raise concerns about grass tetany. Waggoner added that producers should take an inventory of animals with the highest energy requirements versus those with lower requirements and allocate hay and other resources to the most appropriate animals. “In some cases, we can use higher-quality forages and feed those in a limited amount to carry them further and utilize more of the lower quality hay that we may have available to stretch available forage resources, essentially using the highest-quality hay as supplement,” he said. As a guideline, the typical intake for each cow is approximately 2 percent of their body weight per day, or about 28-32 pounds of hay or forage per day to each cow. 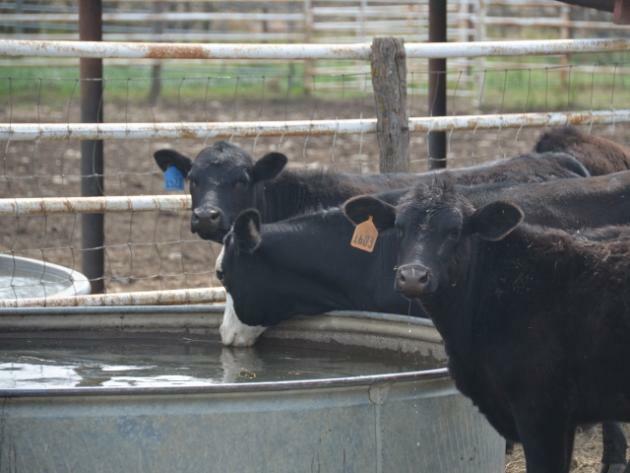 “Once we get into long-term feeding, another option might be to look at feeding and utilizing by-product feedstuff or some sort of supplement to balance out the hay that we’re feeding those cattle,” Waggoner said. “It’s about meeting their requirements for energy and protein. Waggoner said it’s also important for producers affected by the fires to know that they’re not alone. K-State Research and Extension agents are available throughout the state to help producers. Visit www.ksre.ksu.edu to find your local office.